The stunning villa-style AfroChic Diani, part of the Elewana collection, is one of Africa's best kept secrets, on one of Kenya's best beaches. Lying south of Mombasa on the beautiful Diani beach, the friendly, attentive staff provide impeccable service, with a smile. Situated on the south coast of Mombasa on a white sand beach. 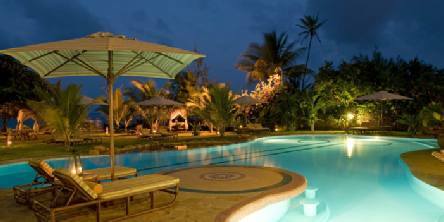 Approximately a 90-minute drive from Mombasa airport plus a short ferry transfer. Approximately a 15-minute drive from Ukunda airstrip. AfroChic blends with the natural beauty of its surroundings, offering fine dining options and a range of relaxing spa treatments. Leisure facilities include swimming pool with massage jets, aromatherapy treatments, TV lounge and library. An 18-hole golf course is nearby. Water sports can be arranged locally. If you can bear to leave this delightful haven for any length of time, there is plenty to do and see in the area. An 18-hole championship golf course is just a 3-minute drive away. 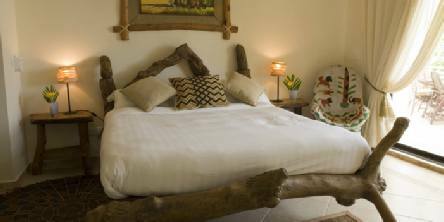 Local craft markets, spas and boutiques are a short drive away, and day trips to both the Mwaluganje Elephant Sanctuary and the Shimba Hills Reserve can be arranged. You will be made so welcome, you will not want to leave! Meals at Afrochic DianiBreakfast, lunch and dinner included. 2019 package holidays to the AfroChic Diani, Mombasa Prices are per person based on two sharing, including flights, transfers and accommodation, and are subject to availability. Flights from Heathrow - other departures also available, call for details. Holiday ref: S0517W.